Yep! That green plastic thing is the map. 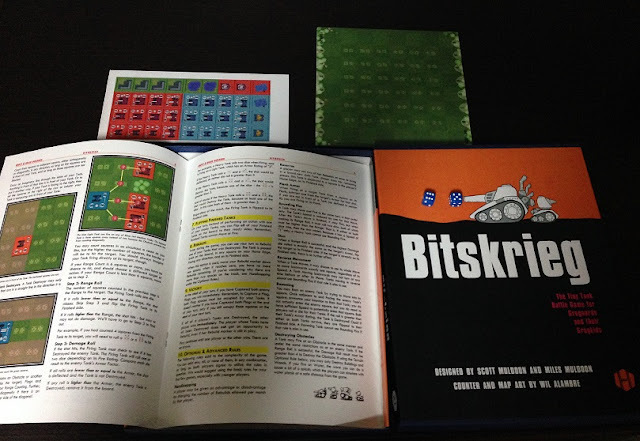 Bitskrieg has a full-color six-page rulebook with clear explanations and example illustrations. The rules are extremely straightforward and written in plain English. I was up and playing almost immediately after punching out the counters. 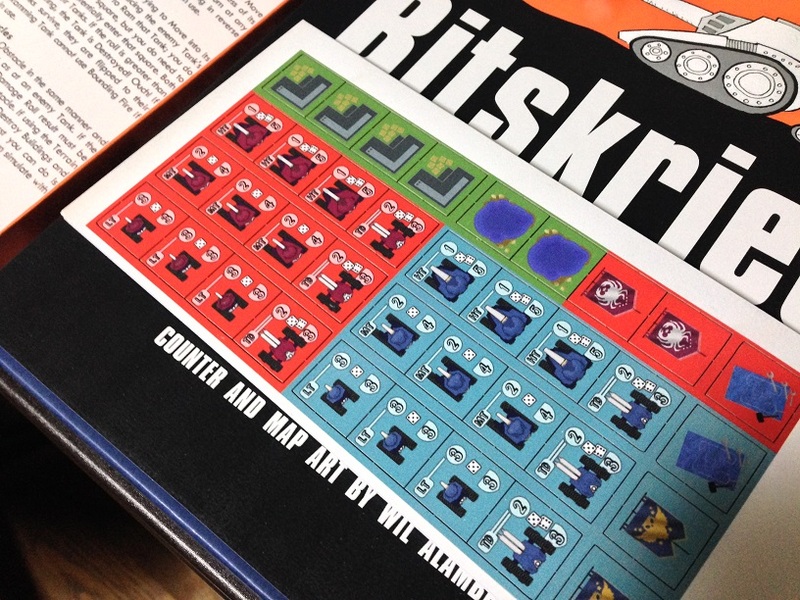 The organization of the rules is good with a step-by-step description of how to move and shoot your tanks at the other guy's tanks. 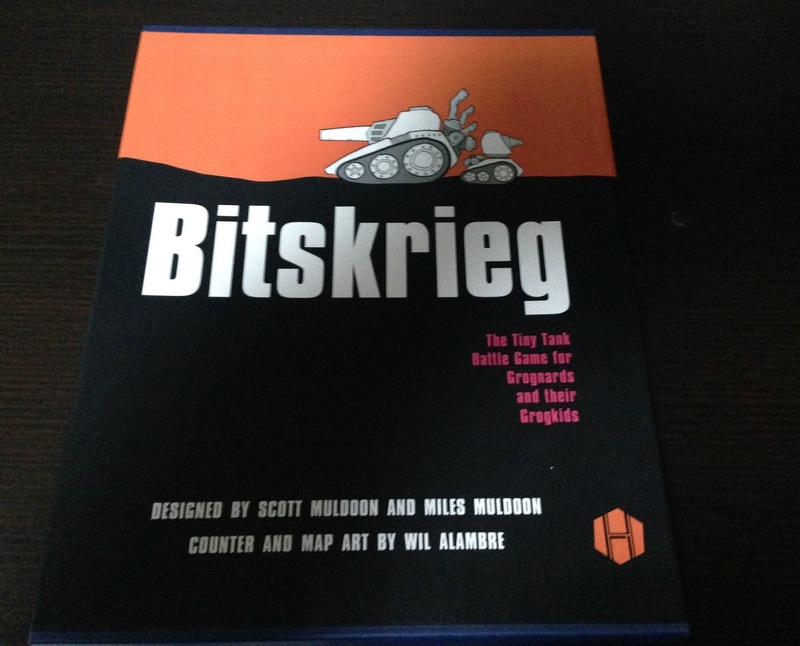 There are even advanced and optional rules here that deal with varying terrain, flank armor, reserves, and much more. 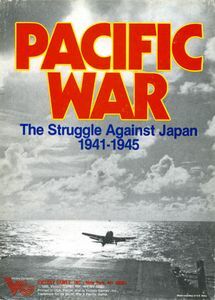 These are all concepts you would find in a more advanced wargame on the same subject. So as your child gets older, you can shake things up a bit and introduce some more nuanced tactics into your gameplay to make things more interesting. 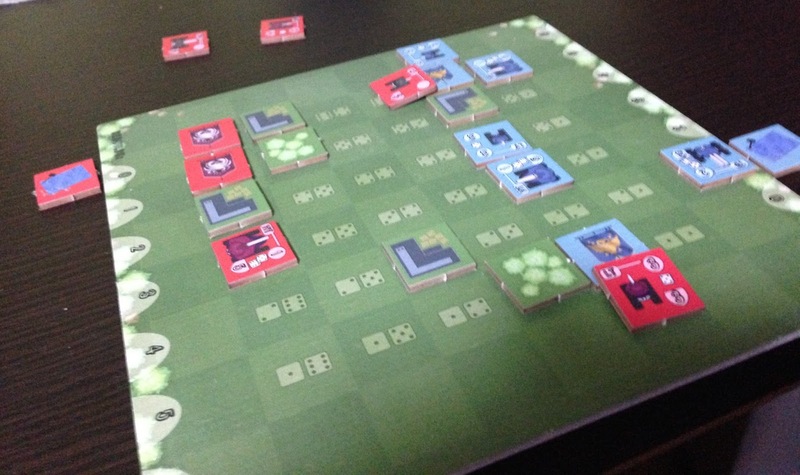 There are 37 counters, twelve of which are tank counters for each side (red and blue). 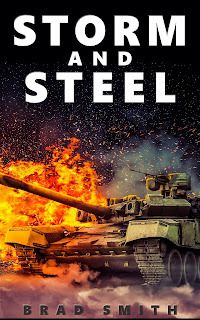 Each side has four kinds of tanks: Tank destroyers, Heavy tanks, Medium tanks, and Light tanks. The counters have delightful little drawings of each tank - the kind of art that you drew when you were in grade 5. It rules! Each tank counter has two sides - a ready side and a finished side. When you want to take an action with a tank, it has to be on its ready side. When a tank is finished with its action, you flip it to the finished side. The font is fun and easy to read. The ready side has three values on it - speed rating, fire rating, and armor rating. The finished side has only an armor rating. There are terrain counters here too. The terrain counters show buildings, woods, and water. Very simple drawings fit the theme of the game quite nicely. Artist Wil Alambre did a terrific job. Each side gets two flag counters and a rebuild counter, which I'll get to later. 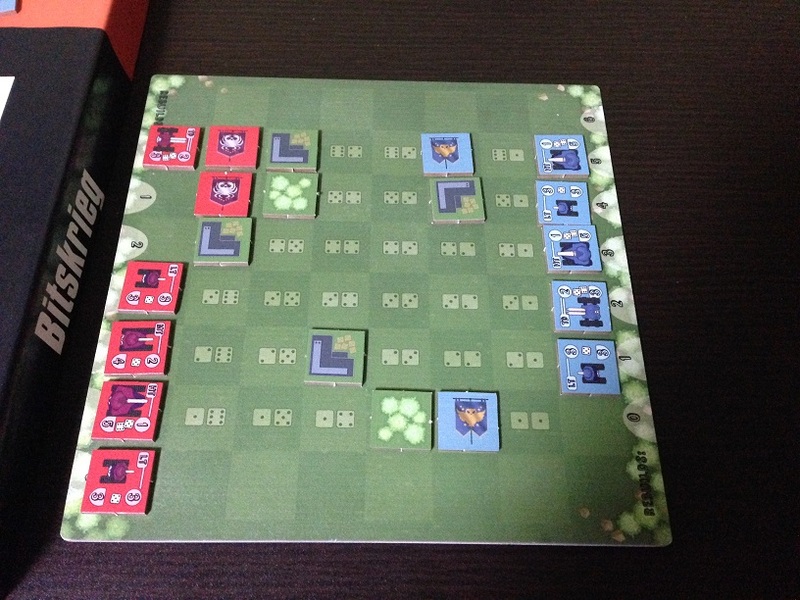 The mapboard is really interesting and I wish more games used this kind of innovative thinking. It's an 8x8 grid on a piece of thick cardboard that could probably withstand greasy fingers and maybe even a coke spill if you are lucky. In each grid space, there are die results. At the beginning of each game, the players take turn rolling two six-sided dice and they place the die in the grid space that matches that the die result. How does this thing play? The game plays, as you would expect, simply and quickly, with little to no need to consult the rulebook past the first few minutes. Basically, each side secretly picks five tanks. Each tank has its advantage and disadvantage. Heavy tanks move slow but are hard to kill and get two dice on their attack. Light tanks move fast but don't last very long. Tank destroyers are deadly but have a limited cone of fire. The players take turns maneuvering or firing with a tank. If a tank gets destroyed, the player may opt to use one of his two rebuilds to put the tank back into play. Victory is achieved when the winner manages to capture both the other player's flags. Combat is simple enough. You count the range to the other tank, roll a die to hit and then roll again versus the target tank's armor to kill it. You can use your turn to "refresh" your finished tanks and get them back into battle or you can use the rebuild option to get destroyed tanks back on board. I played this game solitaire after a very long day and I found it easy, fun, and tense. Red player's tanks were getting blown to pieces by blue's tank destroyers and heavy tanks but red just kept on coming. Out of rebuilds and with only three tanks on the board, red made one final push and managed to get a light tank on both blue's flags. Incredibly, blue's heavy tank, though only one space away from the red's flag-capturing tank, rolled a pair of ones and failed to score a kill. The game ended in a red victory. GO RED! If you are a parent and are looking to introduce your child into wargaming - or heck, if you are just looking for a bit of light fun, Bitskrieg is the game you're looking for. I think you could probably enjoy this with any casual gamer, not just kids. The art and mapboard have a simple charm that brings you right back to those grade five days when you drew tank wars in the margins of your class notebook. Take that, Mrs. Sweetland! Nice one, Brad. Might have to get this! Thanks Aaron! I think you and your kids would like it.